I've been recently trying to emulate this and it works completely fine. But there is one small problem. To beat the game you must use a move that requires the combination of L1, R3 and L3 to be pressed all at the same time. 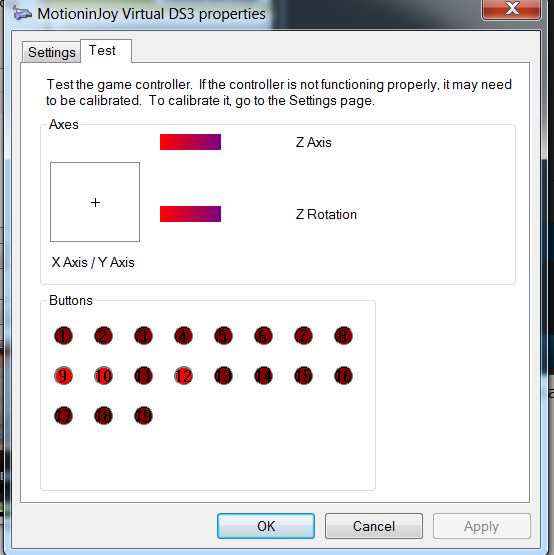 I'm using Ds3 tool, and I've used Better DS3 as well as trying to use my keyboard and none of them would work when trying to do the special move. some keyboards don't support using 3 keys at the same time. that, might be the problem in case of keyboard. Testing with this http://cloudstor.es/f/gLh/, I'm able to press all those buttons at the same time and have it show up, can you check if that is the case for you. I don't think rollover and ghosting is a thing on controllers, I've asked another community about this and they've said that doesn't seem plausible. I can indeed press all three buttons, I"m not sure what it is you linked but I'm assuming it was just a test type deal. http://i.imgur.com/9XFF1ff.png. Stretch Panic is a relatively small game so if anyone could try it out and maybe get it to work and report back. (01-27-2015, 06:56 PM)Faberloomis Wrote: I don't think rollover and ghosting is a thing on controllers, I've asked another community about this and they've said that doesn't seem plausible. It's quite a rare one too. Actually It's the first time I heard about it. I guess you'll have to wait quite a bit until you find someone around here that owns it. It was just a pad test program that you run in PCSX2 using the "Run ELF..." option. I'm fairly convinced that it is a game specific issue and that it wasn't a controller issue, but I figured it was best to double check. (01-27-2015, 07:40 PM)Ge-Force Wrote: It was just a pad test program that you run in PCSX2 using the "Run ELF..." option. That picture says you're pressing R1, L3 and R3 at once. L1 isn't being reported as pressed, Is your pad plugin configured correctly? I don't know why I said L1, that isn't the right button sorry. It's R1 to grab with your scarf and pressing L3 and R3 activates two other scarfs that come out and start attacking. Here's a screenshot of all shoulder buttons and R3 and L3 being pressed. Can you please post the emulog after the problem occurs? What happens if you bind keyboard controls instead of DS3 controls? Does each of these controls work if pressed alone (not as combo)? What happens if you set clamping in emulation setting->VU to extra + preserve sign?